"Cajuns speak an ancient French dialect which few outsiders can follow...mixing little with the modern world, they earn a living by fishing, boating, trapping, and by selling hand-woven baskets and cloths. In a region of few roads, they live on simple wooden houseboats, dependent upon the waterways and the pirogue..."
In many places they were called "Coonasses". Some of them called themselves that still. The bumper sticker "Coonass and Proud" still bedecks many a pickup truck. And lots of Cajuns are doctors, lawyers, architects, accountants, even college professors. You'll find Cajuns selling shoes at Sears, running gasoline stations, driving taxis, flying airplanes, working at chemical plants, operating computers, stringing telephone lines, raising crops and cattle, delivering the mail, running restaurants...doing the same things that people do everywhere. Lots of them wear suits and ties. Some of them, the proud ones, still speak French from time to time... sometimes more often and more fluently than English. They feel sorry for folks who can speak only one language. Some of them are beginning to object to being called coonasses. They say it's an ugly word that came into use after World War 11 by the commingling of sound with the French noun conasse, which means a stupid person of prostitute. Others say it is more innocuous, deriving from cunaso, a word coming from the Caribbee Indians, most likely via the Spanish, and meaning a fellow who lives simply, on and with the land. "Certainly no one will deny that...numerous...Acadians...resisted acculturation until well after World War 11, when improved transportation and communication brought mainstream America into the darkest reaches of the swamp..."
More simply: The Cajuns thought it better to hold onto traditional values, to maintain their own identity. It was a passive resistance, more often a shrug of the shoulders and a perplexed chacun a son gout (there's no accounting for taste), than an active fight. But they resisted, none the less, and with good reason. But understand that the Cajuns aren't the only Frenchmen in Acadiana. There are a handful of French cultures here. The Creoles of New Orleans descend from settlers who came to Louisiana in the early 1700's. St. Martinville was called Petit Paris by aristocrats who fled there during the French Revolution. Refugees from Napoleon's army settled in Ville Platte and elsewhere. French-speaking blacks from Haiti and other Caribbean islands were here early on. It causes some confusion when we start talking about who is a Cajun and who is not. By strict definition, we could limit the term Cajun to descendants of the Acadians exiled from Nova Scotia in 1755. In fact, however, the early French and other settlers mixed and married with Cajuns and, more often than not, adopted their way... so that today, some argue you can find Cajuns who aren't Acadian at all. (There's an old folk saying that you can become a Cajun in three ways: "by the blood, by the ring, or by the back door." You can make a good argument that it is the culture, not the blood, that defines today's "Cajuns". That culture has certain obvious aspects: Not every modern Cajun speaks French, but his grandparents probably did. You'll find Protestant Broussards, Aucoins and Legers today, but they likely spring from Catholic roots. Even townfolks tend to hold some rural values and ways. The cuisine and music hark back to old traditions. Latin blood shows through: Cajuns can be quick to anger, quick to laughter, and quick to change from one to the other. They play as hard as they work, but they work hard. The Cajun can still "make do" from the abundant resources around him. And he still wonders sometimes why anyone would want more. And there are subtler aspects: The Cajuns are a tolerant people... perhaps to a fault. They sometimes tolerate a little too much drinking, a little too much dancing, some chicanery in their politics. Some outsiders cluck their tongues and wonder why. The Cajun suggests that some things just aren't worth the trouble to change. There are those who would argue that a Chinese reared in Acadiana. 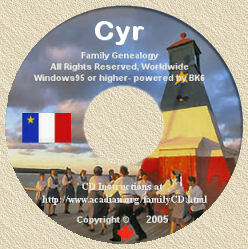 is more likely Cajun than an Acadian reared in China; that "Acadian" has to do with genealogy but that the culture makes a "Cajun". Regional historian Revon Reed claims to count 15 different kinds of Louisiana Cajuns, including Anglos, Spaniards, even Yugoslavians and Filipinos. He can start a good fight by arguing that, in some of the wrong places. The back door to becoming a Cajun opens only so wide. But he's right about this: There's more to being a Cajun than just the blood! The above noted is a re-print (with thanks) of newspaper article entitled "What is a Cajun" by Jim Bradshaw of the Lafayette Daily Advertiser Newspaper.